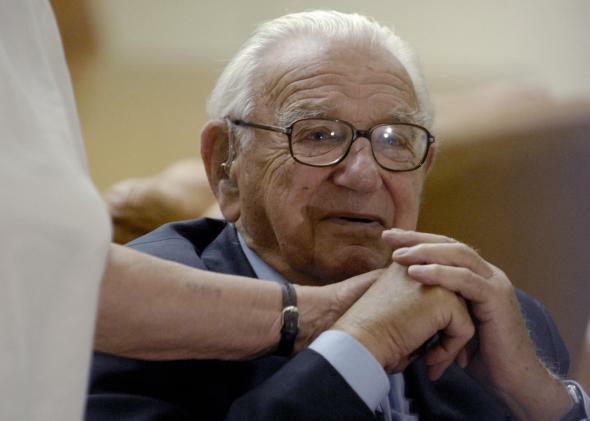 Nicholas Winton: The man who quietly helped hundreds of Czech children escape from Nazis died Wednesday. Winton—who was knighted in 2003—kept quiet about his role in the childrens’ escape until almost 50 years later. On the eve of World War II, several hundred children in Nazi-occupied Czechoslovakia—most of them Jewish—were destined to be taken to death camps. They owed their last-minute escape to the efforts of Nicholas Winton, a British stockbroker who was planning to travel to Switzerland on a skiing holiday but decided on a whim to stop in Prague to assist a friend in Jewish welfare work. While there, Winton organized the rescue of 669 Czechoslovakian children and ensured their safe passage to Britain, where he later found homes for all of them. He died at the age of 106 on Wednesday, 76 years to the day a train carrying hundreds of these children departed from Prague. It was only after Mr. Winton’s wife found a scrapbook in the attic of their home at Maidenhead, in 1988—a dusty record of names, pictures and documents detailing a story of redemption from the Holocaust—that he spoke of his all-but-forgotten work in the deliverance of children who, like the parents who gave them up to save their lives, were destined for Nazi concentration camps and extermination. Born Nicholas Wertheimer to Jewish parents, Winton worked as a London stockbroker. He organized foster families for the rescued children in Britain by placing advertisements in newspapers, tirelessly battling bureaucracy, and offering money out of his own pocket to families who would help host the children. On Winton’s personal website today is a partial list of the hundreds of children he saved, detailing their information and whereabouts. More than 370 of the children that Winton helped have never been traced and do not know the full story of their rescue. As a six-year-old, former Labour Party MP Alfred Dubs was one of the children that Winton put on a train out of Czechoslovakia. “His legacy is that when there is a need for you to do something for your fellow human beings, you have got to do it,” Dubs said.